Those we love never really leave us. We always carry a piece of them in our hearts. This bracelet is a tangible reminder of your affection. True love knows no boundaries. Like this sterling silver token, your connection cannot be broken. Days or distance cannot separate you. 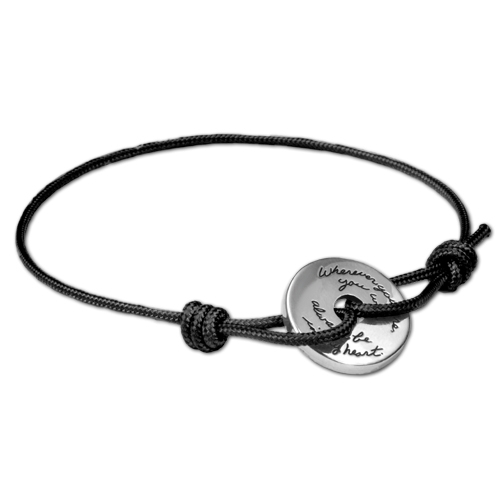 This handcrafted sterling silver cord bracelet makes a memorable gift for so many people. Maybe you want to tell a high school graduate how much you’ll miss them as they head off to college. Perhaps someone dear to you is moving across the country. Whatever the reason, this bracelet is the perfect gift. Whenever the recipient looks at it, they will think of you and your special connection.